According to the latest estimated from IDC, the tablet market saw 47.6 million units shipped worldwide during third quarter 2013, an up from 34.8 million the same quarter a year ago. Apple holds the first place while it saw a drop in market share to 29.6 percent. 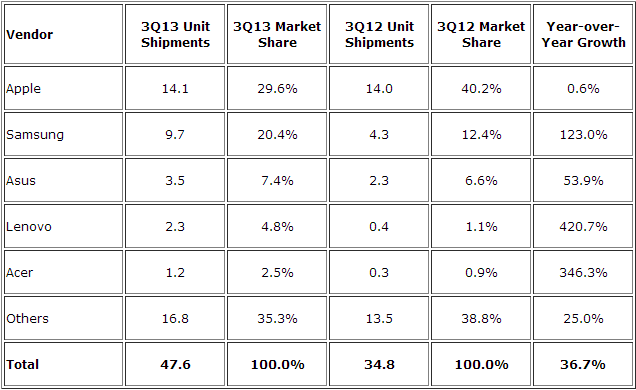 Samsung stands at second place and holding the market share to 20.4 percent. Asus, Lenovo and Acer took third, fourth and fifth place respectively with grabbing 7.4 percent, 4.8 percent and 2.5 percent market share.